Messenger marketing is predicted to become the world’s largest marketing channel in the next five to seven years. In 2017, many small businesses and global brands have set up Facebook Messenger’s chatbots. According to “Bot Services Market 2018 Comprehensive Research Study” the bot services market will reach $1.8 billion by 2023. Arts organizations can enjoy bot services though a low-cost chatbot tool called ManyChat. ManyChat is a chatbot authoring tool that enables the organization’s messenger to automatically interact with its Facebook followers, answer questions, send out mass push notifications, provide responses, and grow Facebook subscribers. One of the advantages of ManyChat is its simplicity. ManyChat’s straightforward setup allows users to test the suitability of this tool for their organizations. Compared to other low-cost chatbots, ManyChat has functions that other builders do not have. This includes messages, growth tools, sequence, flow builder, and auto-posting. ManyChat messages gives followers the option to click on a certain response, download a file, go to a corresponding site, and much more. Messages can be triggered in different ways, including welcome messages, opt-in messages, keywords, broadcasts, auto posting, and sequences. Various ways of triggering messages allow organizations to build meaningful conversations with their audiences. For instance, if an audience types the keyword “Expressionism,” the chatbot can automatically send the image of an artwork of this genre. Visual design always makes the messages more intriguing. According to Facebook Developers Guidelines, Facebook has specified image aspect ratio of 1.91:1. As for ManyChat Gallery image and large image in the first List item, the recommended size is 909x476 px, or at least 500x262 px. In addition, as for media files, the recommended size is less than 23.8MB. Organizations can choose different types of opt-in widgets based on the goals or strategies that their organization develops. When an interested audience member sees the widget, they can click on it to join the messenger. 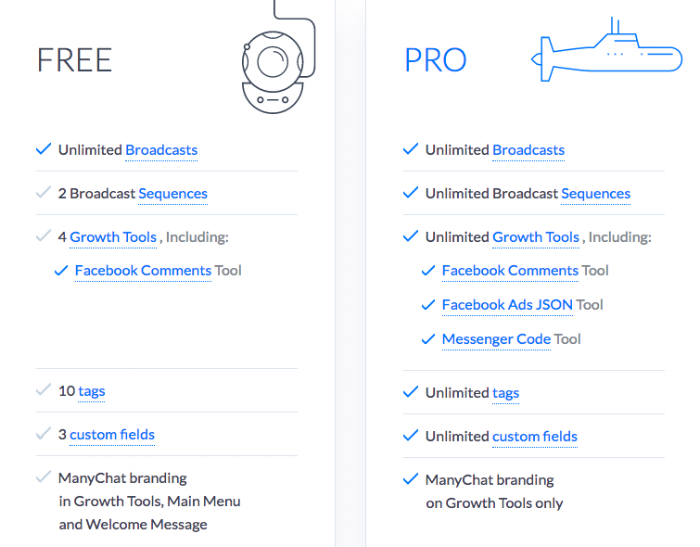 Growth tools can effectively generate more subscribers, by collecting impressions, opt-ins, and conversion rates for ManyChat widgets, as well as open and click-rates for opt-in messages. Organizations can use this data to analyze their audience. The subtext of audiences' decision-making funnel is “What’s in it for me?”. The sequence widget allows users to send relevant series of messages to audiences with different interests. Organizations segment their audiences according to audiences’ preferences and actions, and ManyChat can use this to customize messages. This feature helps the organization retain it audiences, as the audiences will not be bothered by irrelevant information. Flow builder is one of the many user-friendly features in ManyChat. It allows users to reuse content from the existing message flow. Launched in October 2017, it's a brand-new way to build automated messaging within ManyChat. Instead of using the original linear builder, flow builder uses a visual editor that makes it easier to map out how each message is connected. In addition, users can change the flow by simply dragging and dropping. Flow builder has become more useful as the message flows begin to be more complex. Auto-Posting allows users to notify audiences of the new content posted on other channels, which include Facebook, YouTube, Twitter, and RSS. This feature increases the chance for audiences to see the new post and saves administrator time when building new message flows. ManyChat offers a free version, and it even encourages users to start with the free version. The free version is unlimited in number of subscribers, but it limits the number of sequences, growth tools, tags, and custom fields, etc. Once the user decides to upgrade to the Pro plan, ManyChat pricing grows with the number of active subscribers. Pro plan starts from $10 per month for 500 subscribers. And $15/25/45/64 for 1/2/2.5/5/10k subscribers, respectively. ManyChat only counts subscribers who join messenger after the organization deploys the chatbot. In addition, subscribers who delete the chatbot or unsubscribe from it are not counted as active subscribers. Taking advantage of ManyChat’s unique capabilities and tracking its performance are two major goals when starting up a messenger. ManyChat has some limitations and considerations, however. It takes time to build automatic responses and keywords. There is a lot to learn for organizations new to messengers and chatbots. One key guide is Facebook's Messenger Marketing Compliance rules. Organizations need patience, resources, and constant effort to make this system impactful, especially if organizations do not have many followers. Despite these challenges, if organizations are trying to grow their followers, ManyChat is a powerful tool. Have your organization thought of building a Messenger chatbot? Tell us about it in the comments below. "The Future of Messenger Marketing: What It Is, Where It’s Going, & Why the Future Is So Very Bright for Businesses in 2018." ManyChat, January 31, 2018. https://blog.manychat.com/the-future-of-messenger-marketing/. Owens, Asheley. “Bot Services Market 2018 Comprehensive Research Study and Industry Accrues over 1800 Billion at a CAGR of 24% by 2023.” Quebec Daily Examiner. February 2, 2018. Accessed February 9, 2018. https://quebecdailyexaminer.com/pr/bot-services-market-2018- comprehensive-research-study-and-industry-accrues-over-1800-billion-at-a- cagr-of-24-by-2023/66488. Shumovskaya, Alexa. “What are the dimensions of images for Cards, Lists, etc. ?” ManyChat FAQ. February 1, 2018. Accessed February 10, 2018. http://support.manychat.com/support/solutions/articles/36000000877-what- are-the-dimensions-of-images-for-cards-lists-etc-. Tran, Dana. “How to Build a Basic Messenger Bot with ManyChat.” ThinkTuitive. August 1, 2017. Accessed February 9, 2018. https://www.thinktuitive.com/how-to-build-a-messenger-bot-with-manychat/. Pataki, Balint. “Is ManyChat the Best Messenger Bot Builder for Online Marketers? – Review.” Chatbot Tutorial. June 4, 2017. Accessed February 9, 2018. https://chatbottutorial.com/manychat-review/#comments. Guay, Matthew. “ManyChat - Features, Pricing, Alternatives, and More.” Zapier. January 30, 2018. Accessed February 10, 2018. https://zapier.com/apps/manychat.